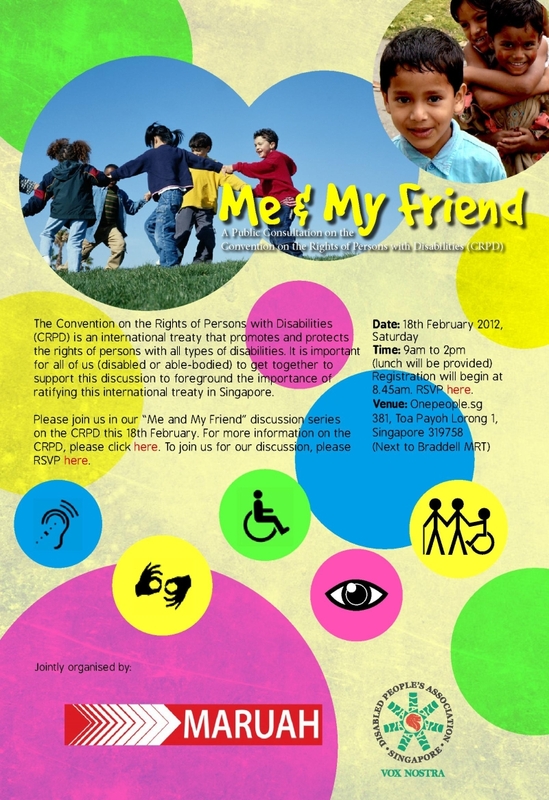 MARUAH is organising a public consultation on the Convention on the Rights of Persons with Disabilities (CRPD). With the Singapore government poised to ratify the CRPD, MARUAH would like to see both the disabled and abled communities come together and share views/inputs on areas of compliance and non-compliance which might lead to a no-reservation approach. This entry was posted on Saturday, January 21st, 2012 at 6:30 pm and is filed under Events. You can follow any responses to this entry through the RSS 2.0 feed. You can leave a response, or trackback from your own site.